It is Monday evening and I am joining in Cathy’s weekly challenge In A Vase On Monday to create a floral arrangement from materials gathered in one’s own garden. Nearby I noticed the strong pink magenta flowers of the redbud tree. Deciding to switch directions, I cut a few branches of this also. 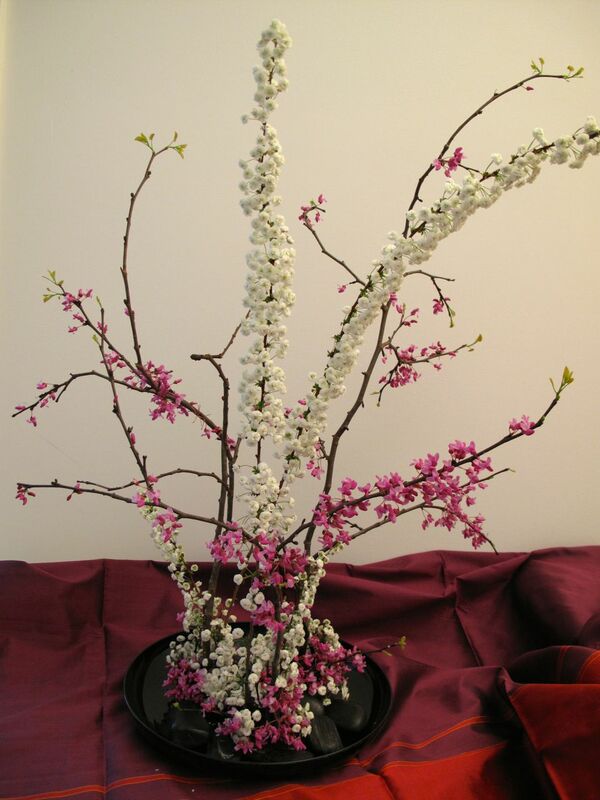 Now my new goal was to display the curving, arching lines of several branches of redbud against the backdrop of a black container. My vision called for sophisticated restraint. To support the arrangement I placed three florist’s frogs into a low black acrylic dish. As I started assembling the arrangement, each placement felt interesting, but it can be hard to know when to stop. Eventually I had included the spiraea also, making the design a bit more exuberant, even frillier, than I had intended. But I like the way it turned out. Black stones set among the flower pins complete the arrangement. I photographed the flowers on a handwoven silk table runner, a thoughtful gift from one of my sisters. 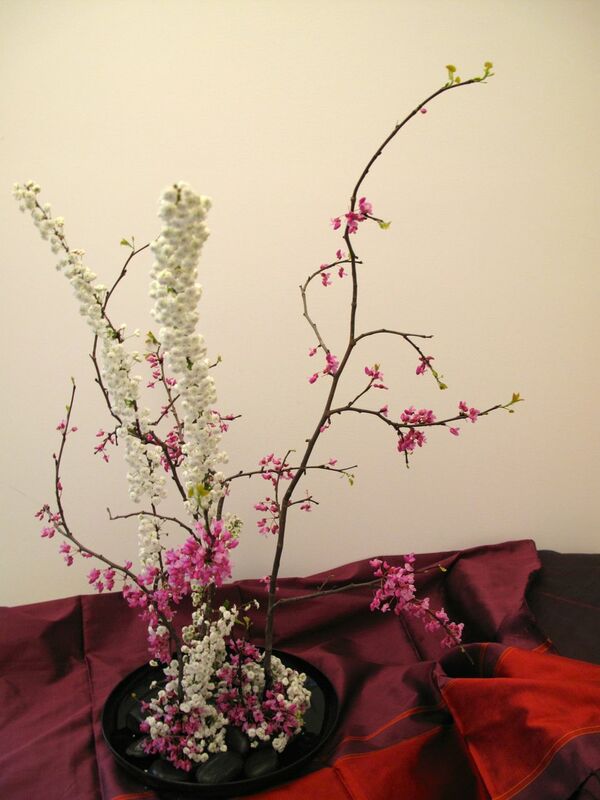 This entry was posted in garden and tagged Cercis canadensis (Eastern Redbud), flower arranging, flower design, in a vase on monday, nature photography, Spiraea prunifolia (bridal wreath spiraea) on April 7, 2014 by pbmgarden. How fun! I love the exuberance of this arrangement. It looks good from every direction too. I wish I had a little of your talent! Thanks! Glad you like this arrangement Marian. Maybe you’d like to join in Cathy’s In A Vase on Monday sometime. I know you would do well. Thanks Pauline. It was a fun experiment. You are so good at this Susie! It looks quite stunning – the Spiraea is a different one to mine – is it also scented? 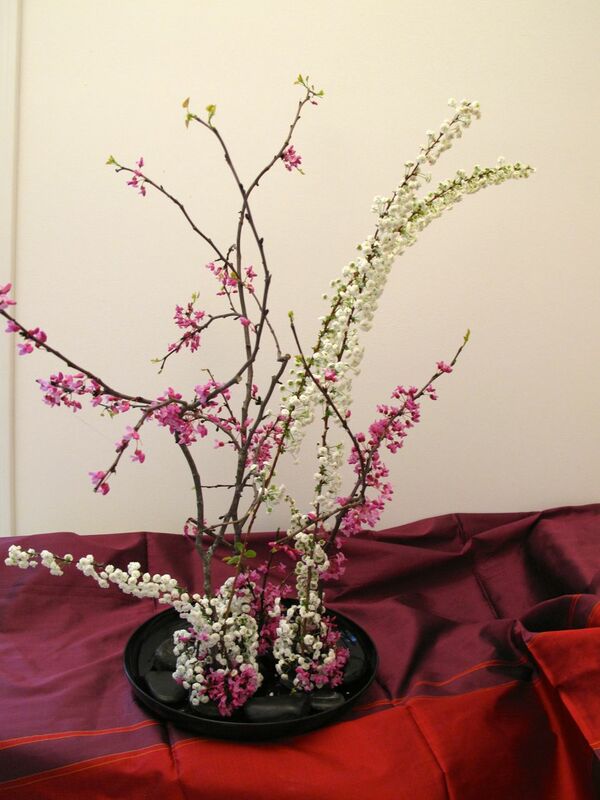 The redbud looks almost like tiny cherry blossoms in the arrangement. Lovely! Thanks Cathy. The arching branches did all the work on this one. My spiraea does not have a fragrance–that would be nice. 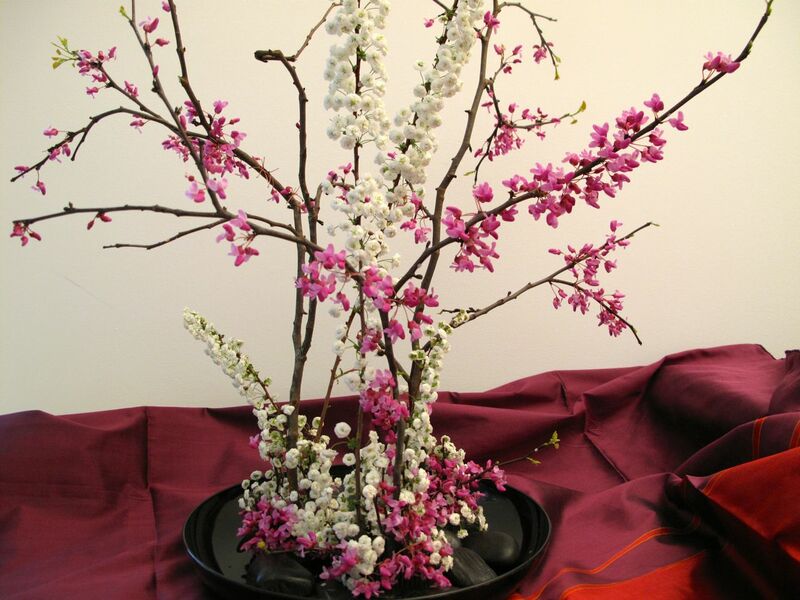 So beautiful – it looks like a floral bonsai! The cersis is new to me – I will have to investigate as it looks lovely! Julie thanks for the kind words. I have been seeing redbuds everywhere the last week. They are native here and grow along the woods’s edge and cultivars are used frequently in landscaping. 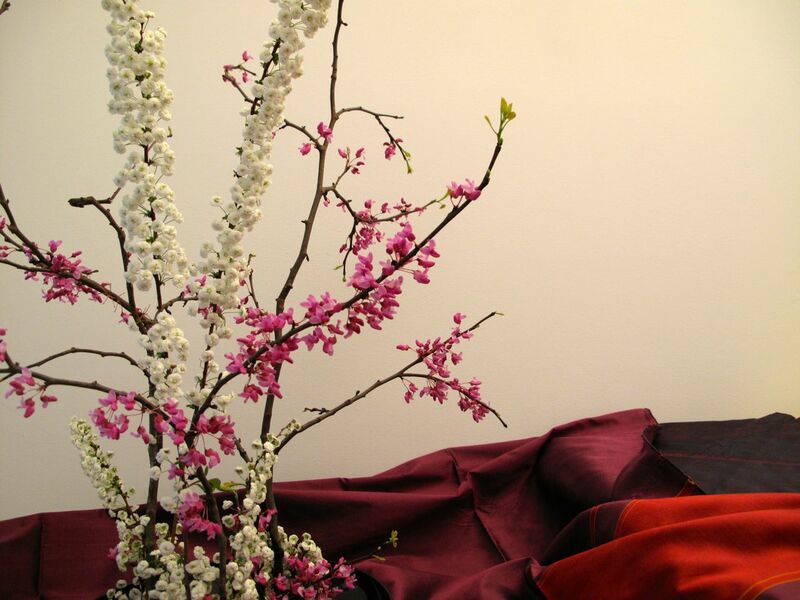 I love that, Susie, reminds me of the Japanese art of flower arranging. You definitely have a good hand at it! Thank you Annette, glad you like the arrangement. I was hoping for a Japanese feel and someday I want to get some instruction so I understand the discipline of it, instead of winging it. I agree with Annette, your arrangement has a Japanese feel about it today. It is very elegant and this also captures spring in a different way. Your mentioned “florists frogs” something else new to me, what are they? 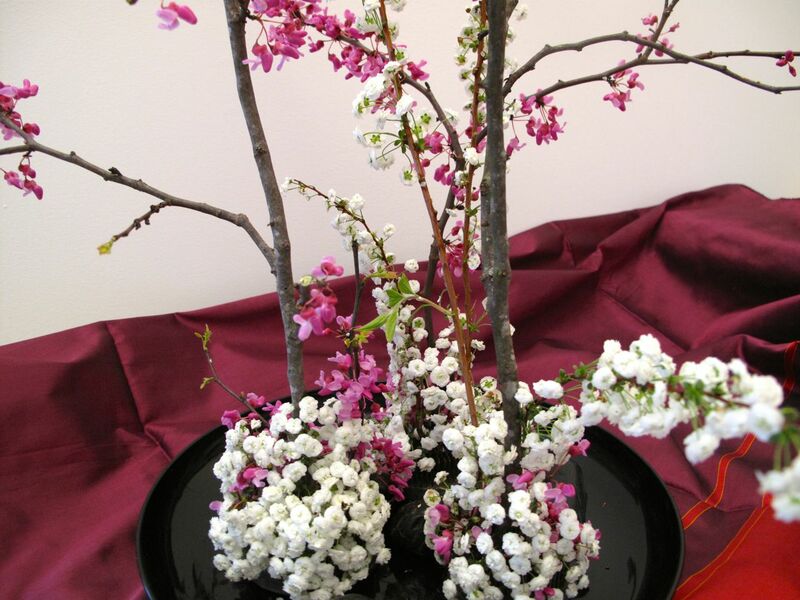 Hi Christina, I wanted the low black container and the arching branches to give it the Japanese-style mood, so happy it came across that way. The florist frog is also know as a florist pin. The ones I used today are 2 or 3-inch round heavy bases covered with closely placed sharp pins. You can insert the flower stem in them and they stand up easily. Google “florist frog images” and I’m sure you’ll recognize them. Lovely. I really like the wildness of the stems and the contrast of colors. Thank you for succumbing to the Monday in a Vase. It is something we have come to pleasantly anticipate on your site. Flower arrangement is an Art. And Art, like Life, takes some practice, too. 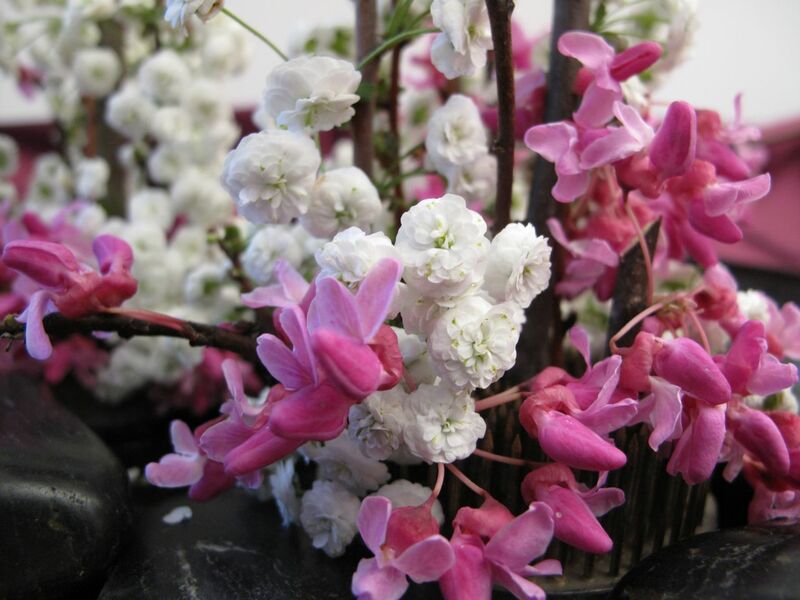 Always lovely, it is inspiring to see your garden move indoors on Mondays with your arrangements. You have outdone yourself this week with a beauteously balanced and expressive arrangement. So glad you like this arrangement and I appreciate your generous comments. Practice keeps us “Doing” and I find this chance to participate on Mondays with a floral design helps keep me focused on doing, creating and moving forward in general. Beautiful! 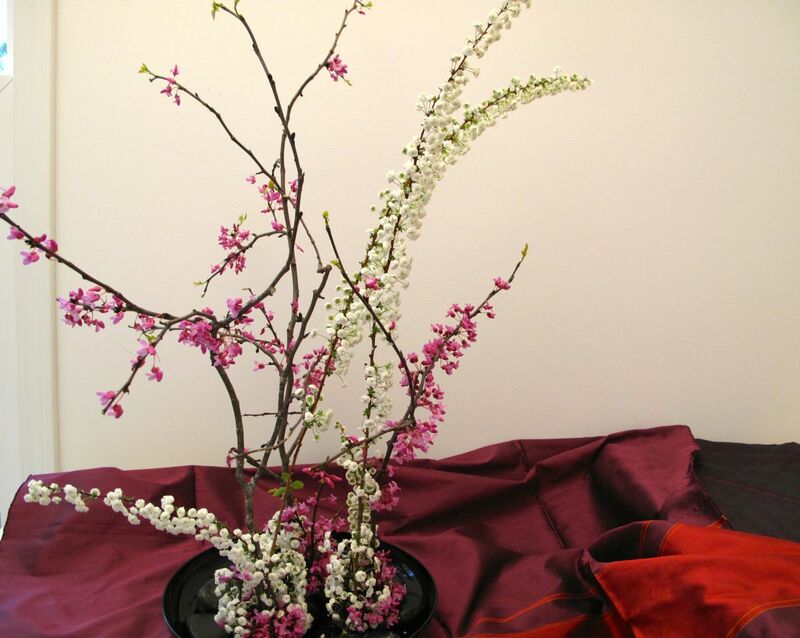 I like the few green leaves on the ends of the redbud stems.